Known as the 'Voice of Zambian football' Liwewe succumbed to liver complications in a Lusaka hospital. His son Ponga said: "He died this morning and we are all sad. He was a pillar of the family and always taught us good morals. We shall all miss him." At his peak, Liwewe who coined the nickname "KK 11" in reference to the Zambian team that died in the 1993 Gabon Crash, became so popular that fans would troop to stadia to watch live games whilst listening to his commentaries on radio. 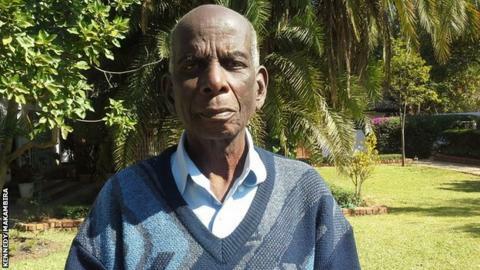 Founding Zambia president Kenneth Kaunda recognised Liwewe's influence on football in the country and awarded him the prestigious Order of Distinguished Service in 1977. The death of the entire team took a toll on Liwewe, who, on doctor's advice, retired from football commentaries to become an inspirational speaker. Zambia's sports minister Chishimba Kambwili told BBC Sport: "We are sad as government. We can't have lost such a man at this stage. He dedicated all his life to football. "He had such a passion for football that sometimes he even used his personal money to follow our national team." Liwewe's death has shocked his personal friend and former Zambia president Rupiah Banda. "Dennis like was a member of my family. I became so close to him because we travelled all over Africa and outside with him," he said. "He was such an inspiration and brand of Zambian football." "It took me 18 months of continuous wave-after-wave bombardment using a 5-3-2 formation because my wife was a hard nut to crack", he said as Sylvia looked on. "She was so beautiful; she had this natural brown complexion - she looked as red as a red card," he added. "Unfortunately, that day I hit a crossbar because she refused to come with me. Having her at the party was like having a through ball but I failed to capitalise," he said as everyone in his living room burst into laughter. "But the ball ricocheted back into play and I counter-attacked. I am now married to one of the most beautiful and God fearing women." He then remarked: "The state of affairs won't remain like this forever. I will bounce back in the second half using a 4-4-2 formation. "If it means taking this match [sickness] to extra-time, I am ready." Sadly, the final whistle has blown on Liwewe's life without him making what would have been a famous comeback.